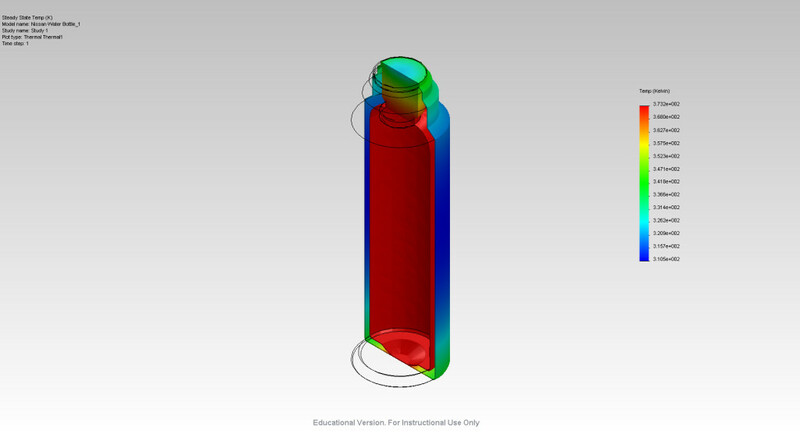 This simulation evaluated the estimated heat transfer in a Thermos Nissan Travel Companion . The CAD models were created in Solidworks 2010 from measured and estimated dimensions pulled from an actual thermos. The thermal analysis of the assembly was completed in Solidworks Simulation 2010. Steady state and transient models were created and studied. Both simulations assumed that the internal temperature is 100 C (boiling water), there is radiation transfer between bottle shells and to ambient, and convection occurs across the exterior shell walls to ambient. A general alloy stainless steel was chosen as the shell material as no other information was available. A homopolymer PP was used for the stopper per the identifier on the actual part. A bonded global contact was used between the stopper and bottle. Using a standard solid mesh with element size ~ 10.6 mm and tolerance of ~ 0.5 yielded high quality results. Shell elements could have been used to speed up simulation time. Steady state gradient with section view. Min 1.97563e-009 K/m. Max 4.34234e+006 K/m. Steady state temperature with section view. Min 310.485 K. Max 373.203 K.